“If something is complex or challenging, it’s actually extremely valuable.” The effortlessly stunning actress Imogen Poots has, in the infancy of her career, made a point of choosing work that is exactly that: complex and challenging. The result has been a diverse filmography that shows no sign of slowing down—which is exactly how Poots likes it. She started 2014 starring alongside Zac Efron in the romantic comedy That Awkward Moment. In Spring  she co-starred with Breaking Bad’s Aaron Paul in not one, but two films: the action thriller Need for Speed and Pascal Chaumeil’s A Long Way Down. She also had a part in the upcoming Jimi Hendrix biopic, All Is By My Side, co-starring Andre 3000. Later this year, she has plenty of new work coming out; she will appear alongside Christian Bale in the highly-anticipated new Malick film, Knight of Cups, as well as four other films currently in pre- or post production. Here, she talks to The Untitled Magazine about her roles opposite James McAvoy in the Trainspotting sequel titled Filth, and how she was particularly excited about her role starring opposite Jennifer Aniston in the comedy, She’s Funny That Way. The combination of these roles will undoubtedly propel the twenty-five-year-old into the covetable position of being one of the most in-demand actresses in Hollywood. 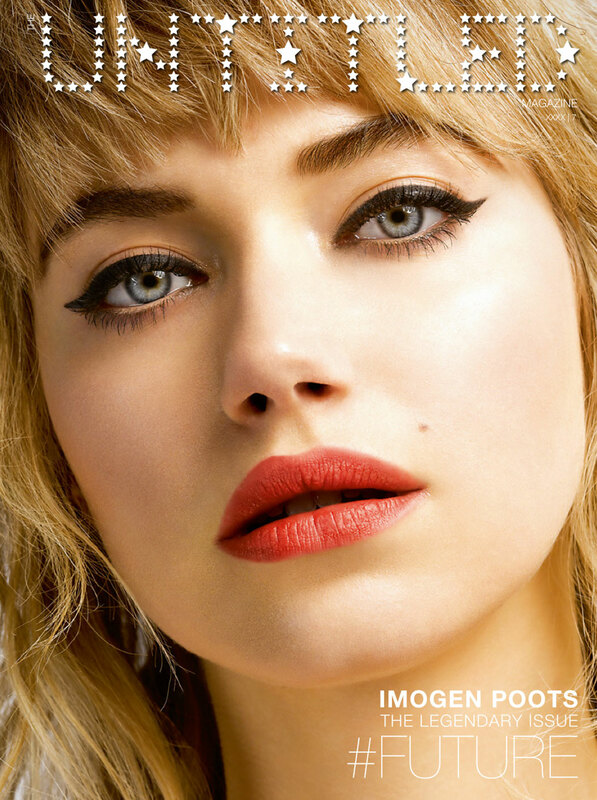 Check out the full interview with Imogen Poots below and pick up a copy of The Untitled Magazine‘s “Legendary” Issue 7 or download the free “Legendary” Issue App on iTunes now! Imogen wears a dress by Zimmermann. Indira Cesarine: When did you first realize that you wanted to be an actress? Imogen Poots: When I was about fifteen, I joined a theater group outside of school. It was something that I found really invigorating, just because it was about confidence within a group of strangers. You all have to trust each other and just come up with something, however crazy the idea was, because it was based on improvisation. It was all about how you could start anywhere, and if the people around you support your idea, then you can just run with it. That was something really powerful that I learned there, and I just loved it. I felt comfortable in that environment, with those sort of people. There was a time when I realized it had been a couple of years, and it was what I wanted to do: you start talking about things in school, you start talking about college and life after school, and I realized I wanted to just keep doing this. Why would you give up something that’s given you such happiness and inspiration? I just loved it. [Acting] surprises me every year; you think you understand it, and then it will throw something crazy at you. I’m sure it’s the same with a lot of jobs, but with acting, because there’s no routine or formula, it’s just constantly changing direction, and I love that. IC: Do you remember your first big role? IP: I think my first big role was 28 Weeks Later, and then the first role that was like ‘Wow, this is cool!’ was on V for Vendetta: it was just a couple of days in Berlin, but it was the experience itself that was crazy because it was such a massive film set. The whole lay-out and the landscape of it was so mechanical and I was like ‘That’s so crazy that something so mechanical is the core of something so artistic.’ It was cool. IC: It must have been a really cool set to be on! IP: It was wild how small everybody was against the big studio buildings. There’s a metaphor in there, that everything was smaller up front…it was interesting. IC: Can you tell me more about your role in 28 Weeks Later? IP: That was an amazing, wonderful time of my life. You look at projects as like relationships. You sort of do fall in love with many people, and I believe that director took courage in his idea, and decided to cast me. It was such a surprise in a way, because you never think someone is actually going to take a risk with you and your weird head, or whatever. But no, it was just a really wonderful way to go to work every day, it was just an eye-opener. Working with actors like Ross Byrne and Robert Carlyle was such a treat to be able to do that at that age. IC: You were only seventeen when you did that film? IC: Do you have a favorite contemporary actress that has inspired your work? IP: I find Amy Adams extremely inspiring. I think there’s a softness to her, and a warmth that comes through in performances even when she’s playing somebody who you shouldn’t like, perhaps, or you should have trepidation about. I think she has this ability to sort of—not manipulate —but certainly, just inspire something new. You might call it a charm, there’s something about that with her acting. I love watching her on screen. Also, I mean, Catherine Keener is always somebody who I talk about; I really think she’s exquisite. IC: You worked with her on A Late Quartet, right? IP: Yes, that’s right, she played my mom. It was an unforgettable experience. Some things you work on, and some actors that you’re around it, it happens that you think about them every single day of your life, because something changed in that moment, something switched off at your braincells. I think about her and how wonderful she is every single day. Imogen wears a gold dress by Reem Acra. IC: You were working at such a young age with all of these incredible actors, were you ever intimidated by that? IP: I think it was probably being young in those environments that helped me. I would think of it as like when you’re on an airplane; when I fly now I’m so aware of like, ‘Oh, I’m on this piece of metal just up in the clouds and having complete faith that everything is going to be fine.’ When I was younger on a plane, I never really thought twice about what I was actually doing. I think with acting at that age too, you just throw yourself into it, and you’re thrilled to be there. As you grow up a bit and become more sensitive to your surroundings or more aware of what this whole industry means, you do sometimes get terrified for completely the right reasons, because it pushes you to work harder, or make yourself vulnerable. You really find the importance of making yourself vulnerable. IC: Coming back to A Late Quartet, which you did with Catherine, you also worked with Philip Seymour Hoffman on that movie. Do you have any reflections on your experiences on that set with him? IP: Absolutely. Again, every day. He is an artist who I think its quite widely recognized right now. So many people felt that generosity of his spirit, and felt that he would fully listen, and take a person in—Catherine does that also. There’s that idea that in their presence, you can completely give yourself over to your fellow actors. I feel like I learned something very powerful from Phil. I think that’s the extraordinary thing about actors or filmmakers, whatever it may be; there’s a trust in each other. But I think that half of it also comes from a place of a theatrical foundation, like those New York satin theaters. It’s a whole support system, artistically. I think that if you can find that, and you can kind of help to invest and construct that environment, it’s a great great thing. IC: Over the course of your experiences working on your various productions, have you ever had a difficult performance or experience that was hard to get through? IP: I think if it’s difficulties because of the complexity of the character, you want to fully embrace that. That again comes back to the whole idea that if something is complex or challenging, it could possibly be extremely valuable. But you certainly start to learn very quickly the differences between that and when there’s maybe a studio involved in a project, which can inevitably put limitations on things. Even clothing options – in True Romance, Patricia Arquette‘s costume is just such a special, unique extension of her character, you just want to eat it all up! It’s a shame with studio pictures when something has to be bland and therefore safe, because then you lose the ability to create something with the character. IC: You’ve done a lot of big budget films recently, like Need for Speed and others that are coming out; do you prefer working more independent smaller productions or the massive, big budget, films? IP: It’s funny, but it has to come down to who is the filmmaker and what’s the role, because your work ethic will remain the same, but it is a different beast, and that has to do with the number of days or money invested etc. But it really has to start from the place of the filmmaker. I can completely say that going to work every day on a Michael Winterbottom film or Terrence Malick or Peter Bogdanovich is an extraordinary day, and you know those days are extraordinary, so that kind of acts as your barometer. The happiest I’ve been was that one day when I turned up at set and we didn’t even know what we were going to do that day, and that’s kind of thrilling. Of course, maybe a studio picture doesn’t allow for that. Unless you’ve got Terrence Malick directing. IC: You have loads of new pictures coming out, opposite Jennifer Anniston, Christian Bale and Zac Efron. What are you excited about most with all your new films? IP: One I’m excited about is certainly Squirrels for the Nuts which has Jennifer Aniston in it. She plays my therapist, which is hilarious. I was struck, to be honest, by how she’s such a strong lady, and I think it’s so inspiring to meet a woman who is so about women, and she really is! So it was really fun, and I liked her so much. The role was just the best thing ever. I mean, I play this Brooklyn prostitute who has a big dream of being an actress, and it’s certainly, in a sense, a farce, like the idea behind the film is sort of interlinking plot lines and characters so it’s kind of chaotic in a sense. What I found interesting is the plot could be seen as quite chaotic, but then you’ve got a filmmaker like Bogdanovich at the head of it who is so simple with his process, in terms of clarity with what he’s going to shoot that day, and how it will be edited. So, all of that together was a really amazing time. IC: How was your experience working with Christian Bale? IP: I did a few days on that. That was a Terrence Malick film. Christian Bale – what an actor! – somebody you can just watch all day long, who is disciplined in his performance. It was just a thrill to be in the creative space with somebody like that. Especially with Terrence Malick at the head of it, for sure. Imogen wears a dress by Notte by Marchesa. IC: Do you have a favorite film that you’ve worked on? IP: I’d say The Look of Love is the film that’s closest to my heart. The Look Of Love and A Late Quartet are two of my favorites, for sure. There was just a sense of electricity to being on that type of film set with those filmmakers and actors. Then there’s the Jeff Buckley film that I did. It was a tiny movie in a way, but it had such a large impact on my life personally. You sometimes look at something like that and you almost forget that it’s a job. It felt like just a period of life caught on camera, for anybody who cares to watch it. There are jobs like that which are pretty special. IC: This issue that we have coming out is our ‘Legendary’ issue. What do you feel defines being ‘Legendary’? IP: I think it’s the idea of leaving your mark. ‘Legendary’ implies, unfortunately, something that could be like a commodity, someone who turns into a brand, and therefore is like a point of universal recognition for X, Y and Z. But I think anyone in their life can find a legend in somebody who has left their mark. I mean that in terms of whether you write an extraordinary play and it’s performed on Broadway, or whether you maintain the advice your father once said to you. There doesn’t need to be any grand shiny element to it – it can be smaller, more intricate, but very, very memorable. It’s just where you’re able to leave your mark in some way, whether it’s on society or on a person. I think that can define something legendary. IC: That’s an interesting point of view on it. Who would you consider to be a legendary artist that inspires you? IP: Certainly I would think about Leonard Cohen and Bob Dylan; those musicians are legendary in my eyes. I’m very affected by a person like Jack Nicholson. To me, he represents a time that has passed, which is sad, but then, it makes that era stand on its own two feet separate from now, otherwise it wouldn’t have the impact that it does. I think of him, and that whole set, in terms of legendary. Also I think about somebody like William Faulkner, too. As a writer, he’s somebody I love and there is something about his writing that you almost forget that it exists on the same earth. It’s the ability they have to move you. IP: Oh Yes! Females! You’re damn right! You’ve got to have Dolly Parton; she’s a friggin’ legend. Dolly Parton, hands down, she’s like the best person in the world. Also Joan Didion; I love her writing. Joan Didion is an extraordinarily wonderful writer and somebody who is an American who is also in love with America, because often you find non-Americans who have an appreciation of somewhere like California, but I always liked reading her writing, considering she is from America. IC: Of the twenty-something set, of young Hollywood, are there any actresses or actors that you feel have what it takes to become legendary? IP: Oh for sure. Let me think about it. I certainly think of Brit Marling, and what she’s achieved and what she’s achieving, just to really be that diligent and get down to it. There’s a sensitivity to her work that I love. She’s able to make something that is completely surreal, and give that a heartbeat in real time. I’m also trying to think of writers and authors… I think Amy Adams, I mean she’s not twenty-something, but I do think that she has an ability to transform into something true to time. It’s not just a quick flash in the pan at all. And in a weird way, somebody like Miley Cyrus. It’s crazy, but she has done something in terms of what choices she’s making. Whatever she’s making, at least she’s making an impact, so you have to acknowledge that. IC: Yeah, absolutely. Miley is definitely a fascinating character. What she has evolved into is definitely having impact. As far as your work, do you have a motto or words of wisdom that you live by? IP: I think my dad once said to me ‘There’s never enough time’, and that has always been very interesting, because that in no way says ‘There’s never enough time so don’t fret.’ but more ‘There isn’t enough time, so maybe just try doing things that you want to do’ and not be in any way overpowered by limits, or the clock, or anything like that. Do what you want to do. I also feel like you’re going to be judged no matter how you do something, so I think it’d be a shame to live your life trying to please everybody the whole time. But, I still think that when you meet good people, I don’t think you can ever beat that. You can never beat good intentions. With anything, I think if you’ve got a clear way to somebody’s heart, or the truth artistically, or what have you, if you can maintain that and try to search for that within this industry, (which doesn’t always cater to that), then that’s important. IC: With regards to your own personal direction, I know that you have crossed over into quite a bit of modeling. Is that something that you like to do and want to do more of? You did Chloe with Sofia Coppola and H&M? IP: I loved working with Sofia Coppola, because it felt like a short film. It didn’t feel like modeling. She really wanted to create characters, you know? I almost forgot about the brand, which I think was important, just to play around with that idea. To be honest, maybe sometimes you do things because it’s a way of getting you to New York, or getting you to help pay your first month’s rent in New York, or something like that. Certainly, you’ve got to leave enough time, say, for something like that. There are brands that I love and adore, for sure, and I think to take part in something like that is not just a payday. It is for wanting to be part of something that has artistically inspired you or something that you feel is really cool and up your street. IC: Do you have a favorite clothing designer? IP: I really like Alexander McQueen and Band of Outsiders. They have great stuff; I’m wearing their duffel coat, they do fab’ things I think. IC: What upcoming projects, aside from what we discussed before, do we have to look out for with you? IP: I’ve got this film called Always By My Side which is about Jimi Hendrix, so that’s pretty good for the legendary issue; we’ve got that at SXSW, so I’m really excited about that! I play Linda Keith, who was Hendrix’s girlfriend. I had a wonderful time making it, and the film is really cool; it was linear on the page, but our director got Malick’s editor to go over it, so it’s kind of got a kick. It’s got something going on with it. Andre 3000 plays Hendrix and he really is just extraordinary in the film. Be sure to head over to The Untitled Magazine‘s store to pick up your copy of the “Legendary” Issue 7!